From the very beginning, you knew your kiddo would be a blessing. In the first months, there were the classic baby issues. You go through endless diapers, bottles, and spit ups towels just like any other parent. But there are some things that your baby does that just stands out. Their hungry cry sometimes sounds like a mass chant, for instance. Other people might find it deafening but you could swear you heard a little Latin in there every once in a while. Then there was the time you brought your baby to mass and little junior really, really wanted to splash in the holy water... coincidence? You think not. 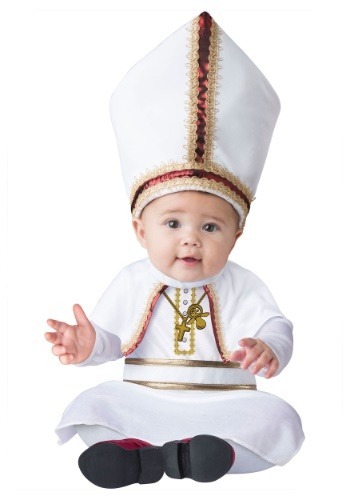 Start your babe on the right path to righteousness with a pope costume that'll let everyone know your kiddo is blessed. Make your little one look ready for the Vatican with brilliant white robes that are trimmed in gold. We love the adorable red satin trimmed cape that frames a cheeky pacifier and cross printed necklace. Securing with a hook and loop fastener on the back, it's easy to change diapers with this costume as the bottom of the robe is open, ready to be layered with white leggings. The look is topped off with a dramatic pope's hat for a look that'll make people adore your holy kid from afar. Want to make Halloween a night to remember in epic Catholic fashion? Reenact the costume that made Barack Obama double over with laughter when you convert your kiddos push-car into a gold and white popemobile! Mom and dad can dress in a variety of religious costumes from cardinals to angels to make sure the little pope is well attended to. But even if this little pope is riding in your arms at the next costume party, you can be sure that everyone knows you're blessed!